This is a tutorial on creating a PHP website template starting with HTML and CSS. We will start with the basics and you can also download the final product. Please remember that I am using very basic CSS styling in this example just for you to get the idea, and not so much to make it look pretty. The download will contain both the styled example as well as a complete blank template that you can use for your own starting point for any project personal or commercial. The demo files are released under GPL V2. Now we are going to create two more folders inside of our main folder. 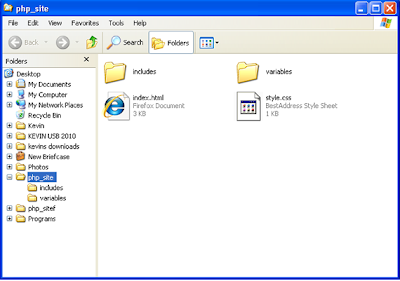 The first folder is going to be named includes, and the second folder will be named variables. Now I am going to open up the style.css file and add the divs we will be using. I have added very basic styling so you can see the site and get the idea of what we are doing. Remember that you can use your own styling when creating your website to suit your needs. 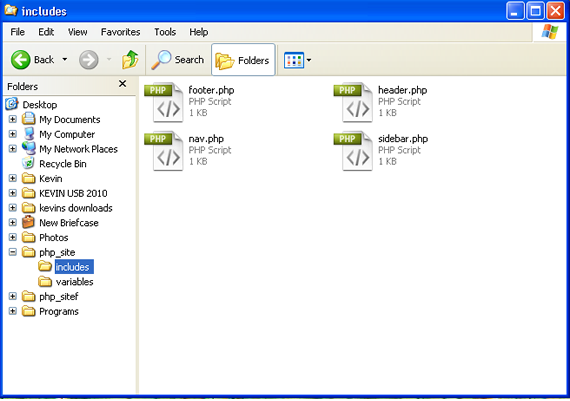 Next we will create some more files that we will be using when we start converting our template to php. Quisque pellentesque sodales aliquam. Morbi mollis neque eget arcu egestas non ultrices neque volutpat. Now we will start converting our template to PHP. We will need to take a brief look at the html code we have and decide which areas will be sliced. We will be removing specific areas from the index.html file and placing them into the php files we have created inside the includes folder. Let’s start with the top of the html document on the header. Copy the header div and cut it from the document. 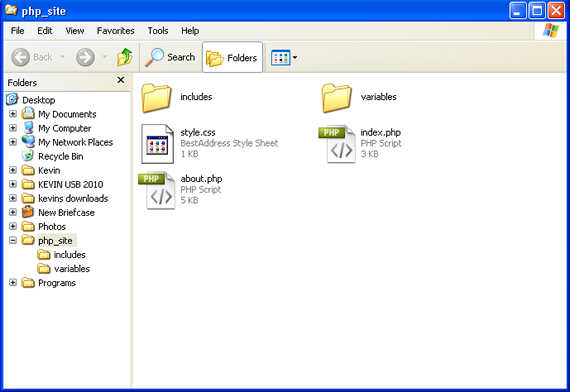 Then open your includes folder, and the header.php file we created and add the code to the header.php. Make sure this area has now been removed completely from the index.html file and placed into the header.php file. In place of this code, we will now add the following to the index.html file. Now our index.html should look like this: (Make a note that the header area has now been replaced with our php include function that is calling our external header.php file). Now we will continue to slice the html document and place the code in the proper php files we made. Next let’s move to the nav div. The same as above, we are going to copy and cut that piece of code and place it into our nav.php file that is located inside of the includes folder. Now it is time to do the sidebar. 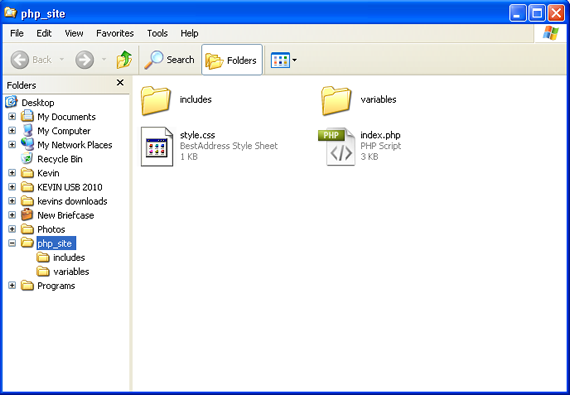 Copy and cut the sidebar div and place it into the sidebar.php file we created that is located inside the includes folder. We will again do the same thing for the footer area. Copy and cut the footer div and place it into the footer.php file we created in the same includes folder. Now that we have created this template, as long as the php includes are on any page we only have to modify the one single file to make it visible accross your entire website. This again is good for anyone with a lot of content and pages. Instead of having to edit the sidebar on every page of your site you can now just edit the sidebar.php file and it will reflect on all of your pages. This makes it a lot easier to keep up with large portions of website material. Now we will make it a little more dynamic and even easier to be able to modify when needed. 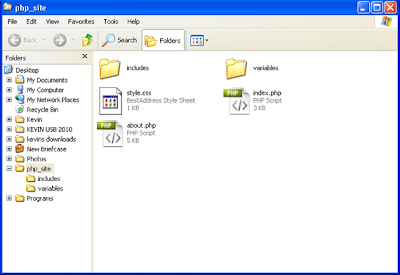 Lets take a look at the header.php file inside the includes folder. We are going to modify this a little bit to change the H2 heading from a different file using a variable. Creating a variable is good for areas on your website that may change more than others. It may also be a good way to allow clients to edit a single file to change certain items on their website. Now our header.php file will look like this: Notice we placed the echo php command within the H2 brackets. This will give our variable output the H2 heading we want. We will add the variable that we are going to echo on the website heading. I have named this variable heading. Now, at any time we want to change what is titled on the heading of our template, we can simply open our variables.php file and modify what is between the quotes. This will always be the output on our header.php file where we placed the echo command. Let’s change this like we did the header file, and add a variable to use. This is to ensure the code is read properly by browsers. If you use a regular quote it will not work. The last thing we need to do in order to make our variables work is to do one last php include within our template to call the variables file. This will tell our template to use the variables file we have created. Now that these two files are calling the variables, you will see the reflected results in the final template. 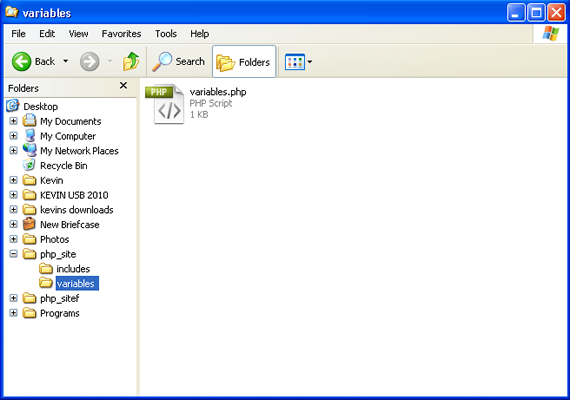 You can always create new variables, and create any type of php files you want. 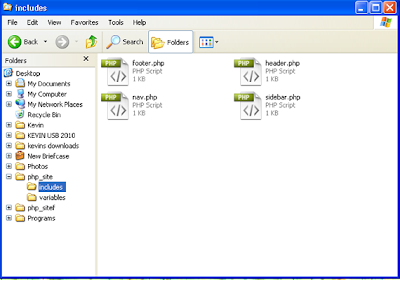 You can even change the folder directory in any way you wish as long as your php include function displays the correct path to the files. To test it a bit further let’s duplicate the index.html file and make a second page that will also call the external php files. This way we will be able to see more exactly how this works. Now make sure that we go inside of our nav.php file as well as the sidebar.php file and link the new page we have just created. Again using your html editor of choice, first open up your nav.php file. Next we will need to do the same thing to our sidebar.php file to make sure the links now work. Now we are complete. We have created a two page PHP website template that we can expand on more to make a completed project. We have learned how to use basic php includes and variables to be able to edit content accross many different pages at one time. I really hope you have enjoyed this post and learned something from it as well. This tutorial was created to give you some basic knowledge on php and creating a php website template. If you have any questions I will do my best to answer them in the comments below.